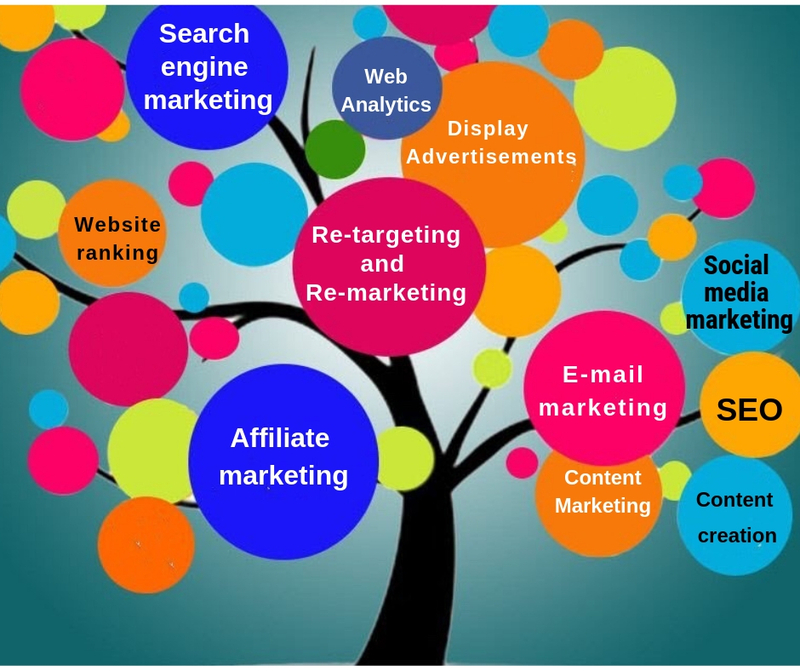 Digital marketing is one industry which is growing and evolving continuously. More and more companies are employing digital marketing to reach and to create an audience online. Businesses gain a reputation online, increase their market growth and also compete with other firms in their respective industry all through digital marketing techniques. We all know companies like Amazon, Nykaa and Flipkart, these e-commerce websites are quite popular and they are always on the top. They often use a popular digital marketing technique called behavioural re-marketing, which involves showing the customers online advertisements based on what they searched for before on the site. 2.Website ranking or SEO: Have you ever wondered why only a few pages show up on the first page of google search results? It’s because the content on the website contains certain keywords, these keywords are nothing but the most searched queries on the search engine. The more keywords a website incorporates the higher will be its ranking in the Search Results. The process of finding and using these keywords is called Search Engine Optimization, which is another popular digital marketing technique. Here in the Above example, when the user searched for the “Best Digital Marketing Campaigns in 2018” the top 2 results were from digital marketing institute, its because they included the keywords required and optimized their pages. 3.Display Advertising: Digital advertising is done on websites, social media platforms, mobile applications. Advertisers generally convey a commercial message through these ads. They generally present display ads to a targeted audience who might have some interest in the product or service. There is a variety of display as such as- text ads, banner ads, flash, video ads, bumper ads, in-stream ads, discover ads, which also includes Rich media interactive ads (RMIA), display adverts can be made on Google Ads. 4.E-mail marketing: Almost everyone on the internet has an email id and this makes email the most powerful tool of digital marketing. It’s cheap and easy to use and it will also help the brand or business to create a good impression. Sending personalized emails to customers will grab their attention and it will be useful for them. If you can come up with a good email marketing campaign. Customers will most likely lean towards your brand for buying products or services. 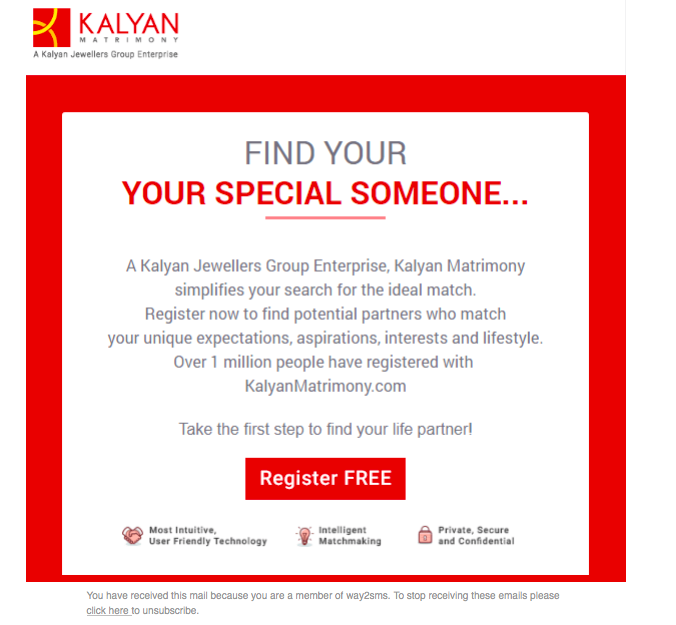 The above picture is an example of an email marketing campaign, by Kalyan Jewelers called “Kalyan Matrimony”. They are trying sell both a product and a service, jewelery and a matrimony site respectively. 5.Search engine marketing: Search engine marketing is nothing but marketing online or internet marketing, through paid advertising, which involves promoting one’s website and making their presence visible on search engine result page (SERP). Within these paid advertisements there are certain bidding strategies through which a website earn money depends upon the no. of clicks/ views/ impressions/engagements which are commonly called as CPC/PPC, CPV, CPM, CPE etc. 6.Affiliate marketing: Placing banner ads on certain website spaces is a good way to get traffic to your blogs or business page. However, sometimes the advertisements get very little traffic to your website and they cost more. To avoid this kind of loss, a brand or a business can use the affiliate marketing strategy. Affiliate marketing can be defined as a performance-based marketing strategy, wherein the rate of an online advertisement will depend on the traffic generated by that advertisement. • It is a cost-effective way to advertise. • The advertiser is more likely to get more revenue when more people click on the advertisement. Therefore, the advertiser will have an incentive to promote your brand, business or company. Affiliate marketing creates a win-win situation for the one placing the advertisement and the advertiser. Social marketing is a technique in digital marketing which aims at understanding and engaging an audience through social media platforms. It is important to identify which social media network will be the most effective to reach your target audience. For example, if your target is to gain customers of the 18-25 years age group you should post videos on youtube or post visually attractive ads on Instagram. Or If your target is working professionals you can use LinkedIn to reach them and engage them with your ads or blogs. 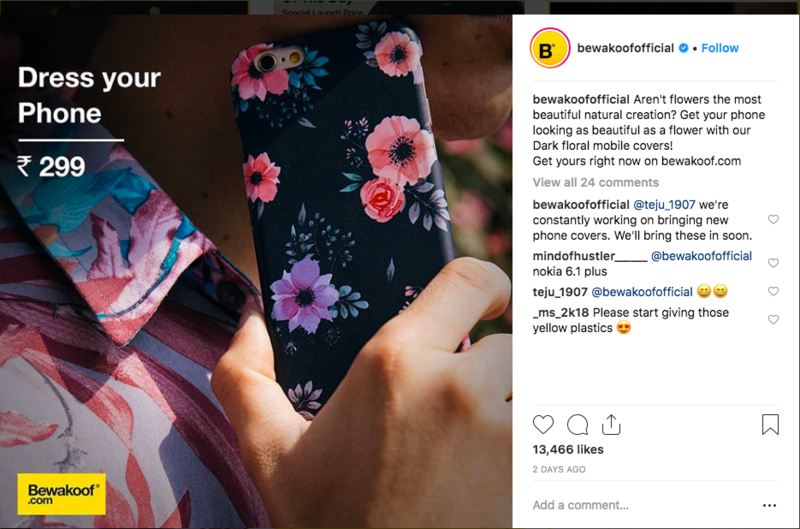 Here is an Instagram ad, it is visually attractive and it attracts the attention of the users. 8. Web Analytics: Web analytics is a procedure of reporting, storing, measuring, collecting the analysis of the behaviours of the visitors on the website. So according to visitors or viewers of your website you can create content according to their interests and needs. Web analyzer like google analytics simply keeps a check on the behaviour of the user, for instance, the most viewed web page, the total number of viewers, the number of clicks and so on. 9.Content creation & content marketing: Every digital marketer dreams of creating content which will go viral. Content creation and content marketing go side-by-side. Content marketing does not push people to buy a product or service, instead, it pulls people towards them and generates curiosity in their minds. When people read content, they connect to the brand and develop a sense of loyalty towards that brand. Content marketing involves, writing blogs, posts for social media and making interesting and informative videos.